Ask any sales person, and (s)he will tell you that sales are the lifeblood of the business. And for the most part of it, we wouldn’t argue. After all, the sales person (often YOU!) is the person who is getting someone to part with his or her cash in exchange for your good or service. But where does marketing come into the process? Marketing makes / decides what the business sells; the sale person sells it. The dichotomy comes when you lump them together into ‘sales & marketing’. Our truth is, that sales is a communications element of your marketing mix; and the two must dovetail and be like siblings. What’s more, we like to think of the traditional concept of sales as being more of presenting (potential) customers with an opportunity to buy. Let’s face it, none of us likes to be sold to, but most of us love to BUY. But the sales person is limited by the product (good or service), targeting, vision, goals, pricing framework and method that the marketing function guides them towards; which is why your sales efforts will only succeed if your marketing objectives are crystal clear and easy to understand. Let’s take the example where the sales person works like crazy and gets the sale, only to be let down by the back-office functions and infrastructure / lack of communication and order / invoice processing. Well, marketing function, got news for you…that’s your responsibility. 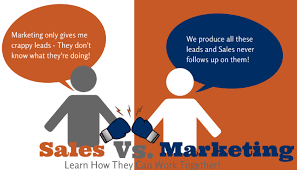 Conversely, (in our scenario) the marketing function puts out lots of effective communications and invites prospects to engage…and the sales person fails to follow up and develop a deeper relationship with the said prospect; salesperson, that’s your responsibility. The practical reality is that you need to align both functions (even if they’re done by one person) very accurately, and dispel any sense of rivalry. Both are pivotal to the success of your business; it’s just that marketing usually precedes sales and is less immediate in terms of tangible results, so you MUST exert appropriate effort and patience in both disciplines. There’s much more we can elaborate on this subject and we can signpost you to many resources for free on the web and through our partners. We can’t cover the whole subject here, but hopefully we’ve given you a few morsels for thought as you continue on your entrepreneurial journey. For more help with your startup business, call us on 0121 516 0330 or book on to one of our FREE 2-day workshops in Staffordshire, Worcestershire or Solihull, or visit http://www.enterpriseforsuccess.co.uk or click on https://www.eventbrite.co.uk/d/united-kingdom/enterprise-for-success/?mode=search for events in this spring and summer. And most of all – keep the faith! And remember, you’re not on your own!